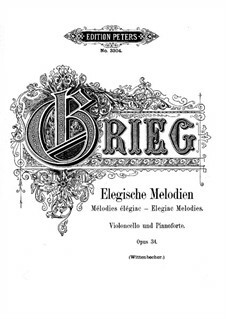 One of Grieg's most serious pieces. 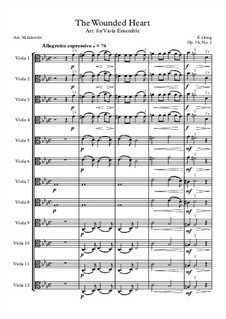 A wonderful piece for the Brass Quintet. 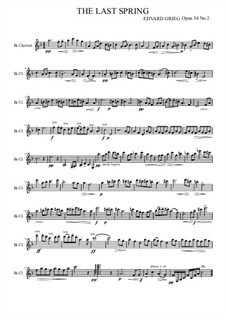 Grieg’s famous song transcribed for Brass Quintet. 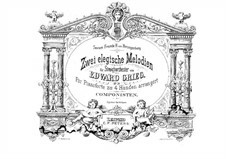 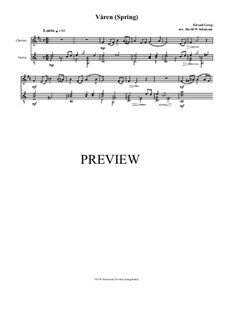 One of three Grieg arrangements I have made for flute and classical guitar. 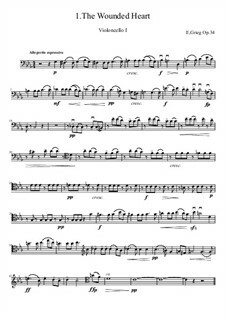 The flute part can also be played on alto recorder. 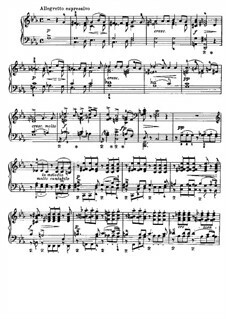 Edvard Grieg: Last Spring. Arr. 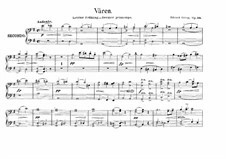 for Viola Ensemble. 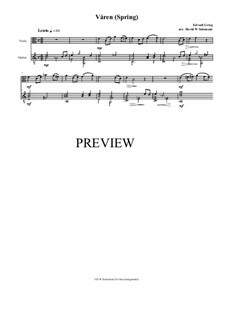 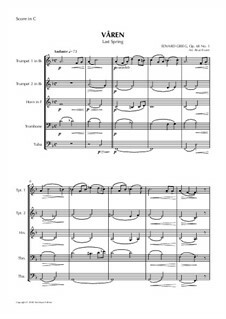 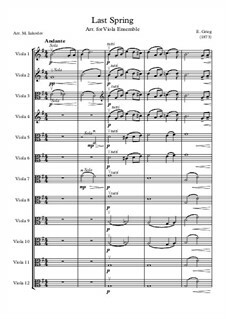 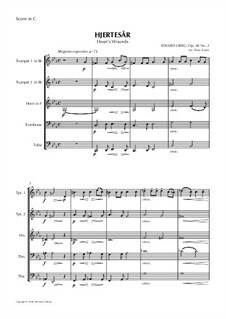 This is one of three arrangements that I have made of three songs written by Edvard Grieg for his Peer Gynt Suite. 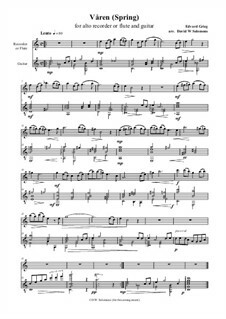 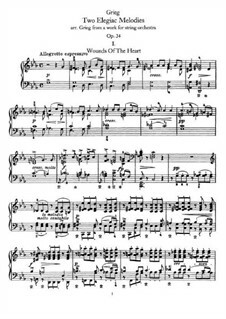 This is one of three instrumental arrangements that I have made of three songs written by Edvard Grieg for his Peer Gynt Suite. 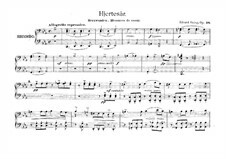 For piano Arranged by Kretzschmar H.
For four cellos Arranged by Kato K.
For cello and piano Arranged by Wittenbecher O.
No.1 Hjertesår, for Wind Quintet Arranged by Kvam R.
No.1 Hjertesår, for viola ensemble Arranged by Iakovlev M.
No.2 Våren, for Wind Quintet Arranged by Kvam R.
No.2 Våren, for flute (or recorder) and guitar Arranged by Solomons D.W.
No.2 Våren (The Last Spring), for clarinet Arranged by King S.
No.2 Våren (The Last Spring), for viola ensemble Arranged by Iakovlev M.
No.2 Våren (Spring), for violin and guitar Arranged by Solomons D.W.
No.2 Våren (Spring), for cello and guitar Arranged by Solomons D.W.
No.2 Våren (Spring), for viola and guitar Arranged by Solomons D.W.
No.2 Våren (Spring), for cor anglais and guitar Arranged by Solomons D.W.
No.2 Våren (Spring), for clarinet and guitar Arranged by Solomons D.W.
No.2 Våren (Spring), for bassoon and guitar Arranged by Solomons D.W.
No.2 Våren (Spring), for alto saxophone and guitar Arranged by Solomons D.W.